goals – Pump Those Crazy Legs! The results are now in, and I’ve had a chance to sit and look through the paperwork to try and make sense of it all. Not too surprisingly, my lactate values indicate that I still have work to do on building up my aerobic base. While I’m amazed by how fast I have become capable of running, I do feel it when I am out there on my longer runs. Anything over 10km and you will see a steady decrease in speed as I struggle to keep going with the same intensity. Clearly I have to focus on longer runs and building up my endurance to be out there longer, so that I can achieve my goal of running marathons! For Sunday long runs we are supposed to be in our Zone 1 in order to build up our aerobic base/endurance. I had been running a little on the fast side, so it looks like I can bring down the pace even more to reap the benefits of my distance training. For my long runs I think I should be out there for a good 4 hours at least to get my legs used to working for that long. So now I’m wondering how long it will take me to build up a good base from this point on, and whether I should delay my next marathon race from October until perhaps April/May of next year, when I’ll probably be a bit stronger and notice more of a difference. The test results also showed that I am an efficient runner, which probably explains how I managed to get so fast despite my fitness level, lol!! My VO2 Max came out at 38.8ml/kg/min. The last little bit was information on nutrition, and proper fueling during training. That is, how many grams of carbohydrates and even proteins I should be consuming during a run to help maintain and even enhance my performance. Because I have a pretty strong stomach, I’m actually thinking of bringing a little protein bar with me for my long runs now, to incorporate along with my gels and electrolyte drink! I’m definitely curious to see how that goes. I suppose this all started with me just needing a good run to clear my head, even if only temporarily. I got out and the weather was amazing: 15°C and sunny – not your typical weather for November in Ottawa! So I decided to go off on a little adventure, and headed to the Prescott-Russell Trail. Usually I just run a short part of it and then continue on through the neighbourhood. But this time I decided to stay and do my whole run on the trail. It was nice and quiet, and my legs felt good. Realizing I could certainly benefit from a little pick-me-up, I decided to try again for that 21.1km goal! I had to laugh at how ill-prepared I had been for this run once I got into it. I mean, it was only 2km in that my bluetooth headphones died, leaving me with nothing but silence and the company of my own thoughts for the duration of my run. I didn’t think to bring gels or sustenance of any sort, but had thankfully eaten a piece of toast with peanut butter before heading out! 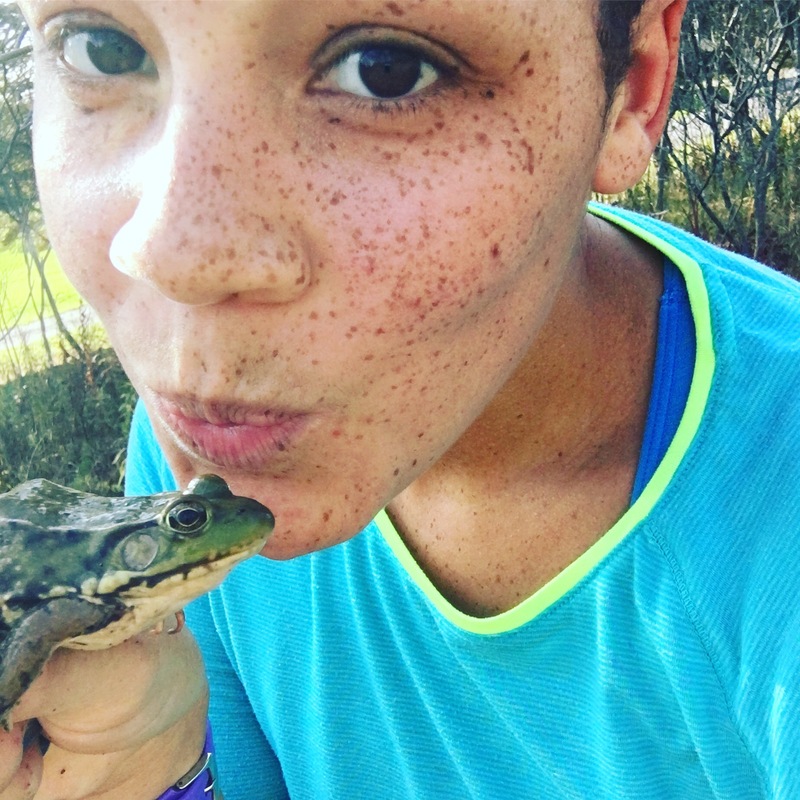 I wasted time taking selfies, and even stopped to catch a frog! Then I used my precious limited amount of water to wash my hands afterwards! Not preparing for a half marathon meant that I only had my two little bottles on me instead of a full hydration pack. So I was kicking myself when I ran out of water with over 6km of running left to go. But by then I was determined this was going to be the day! I needed this! I had to complete this run! I managed to make a good run of it until about 16km, at which point I realized that I still had a whole 5k ahead of me – and it wasn’t that long ago that 5ks used to be my entire run! I started to feel my legs weaken as I hit uncharted running distances. And it all paid off. What an amazing feeling it was to see that I had completed a half marathon all on my own! So proud! In disbelief! And so excited to share my story – You guys won’t believe what I did today!!! Thinking about it, I’m glad that I did my first half marathon on my own rather than in a race. It was a difficult challenge that I wasn’t too sure I could complete (as I had tried on my runs a couple of times before). Running on my own also meant that I could pace myself and take as many walking breaks as I needed without feeling any pressure to speed up. That being said, today the Army Run opened up a special discounted registration for next year’s race and I did just sign up to do the half marathon – eeek! It’s Thanksgiving weekend here in Canada, and what better way to spend the morning than by watching Kelly Roberts of Run, Selfie, Repeat run the Chicago Marathon in the hopes of achieving a qualifying time for the 2018 Boston Marathon! Kelly has been vlogging daily on YouTube about her quest to BQ, and all the training (both physically and mentally) she’s been undergoing to get to this point. It has been a truly amazing and inspiring journey to witness. I think a lot of runners can relate to how she was feeling – particularly her open honesty about her fears and doubts, and just getting her mindset where she needed it to be in order to take on such a huge goal. I know she has inspired me not to be afraid of taking on bigger challenges – in running and in life! Kelly is known as the runner who brilliantly distracted herself during a cold half-marathon in 2014 by stealthily snapping selfies during the race with hot guys in the background and then uploading them to Instagram! She is such a funny girl, and definitely found a way to show people that running can be FUN! Having run marathons before, it was amazing to watch Kelly when she decided to up her game and see if she could get fast enough to qualify for the Boston Marathon – which is about elite a race as you can get! For her age group she’d have to run 42.2 kilometres in 3 hours and 35 minutes – her best time to date has been 3 hours and 59 minutes. Added to this was the fact that she had only 6 months to get there! So this morning I’ve been tracking her run live using the Chicago Marathon app! As well as watching all the videos her friends have posted to her Facebook page from various points along the race course. It’s been such an exciting journey! I can’t believe how personally invested I have become in her journey! Kelly has grown so much these past few months come so far – I’m speechless! Update: Kelly’s vlog about her experience at the Chicago Marathon & how it went!